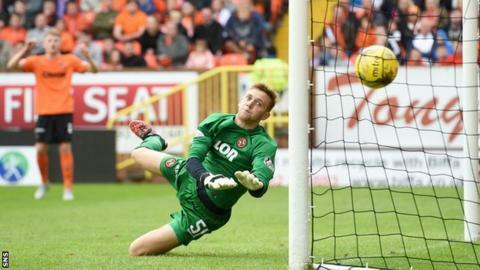 Kenny McLean's late looping header gave Aberdeen all three points against Dundee United at Tannadice. The hosts had chances in the first half with Chris Erskine, Charlie Telfer and Mario Bilate all going close. But the Dons grew stronger as the game went on and Jonny Hayes fired wide before Andrew Considine's shot was cleared off the line. Aberdeen kept pressing and McLean finally found the net when he directed David Goodwillie's cross into the net. The two sides had met on the opening day of last season, with United taking advantage of the Dons European adventures with a 3-0 win. This time, Dons boss Derek McInnes, fearing a repeat, made four changes after the long trip home from the midweek Europa League third qualifying round defeat in Kazakhstan - and the freshness paid dividends. The fast pace of the game was typical of recent New Firm derbies and United's Erskine and the Dons' Cammy Smith both made early runs through the middle before working the goalkeepers with low drives. There were very few clear-cut opportunities in the first half, but Dundee United striker Bilate was handed a golden opportunity just seconds before the break. However, he fired his effort straight at goalkeeper Danny Ward from just 10 yards out. Aberdeen came out much stronger in the second period and it took a terrific goal-line clearance by United captain for the day Ryan McGowan to deny Considine's effort from the corner of the six yard box. McInnes threw on Goodwillie and Niall McGinn as his side refused to settled for a point with the game heading towards ending goalless. Goodwillie swung in a cross from the left hand side and, although it was a poor delivery, McLean stooped low to back head the ball from around 10 yards on the angle and into the back of the net in off the underside of the crossbar. It was a piece of magic that the game badly needed and, despite United attempts, the Aberdeen defence held out with some ease to begin their league campaign with all three points. The victory also gives them a boost ahead of Thursday's Europa League second leg against Kairat Almaty. Match ends, Dundee United 0, Aberdeen 1. Second Half ends, Dundee United 0, Aberdeen 1. David Goodwillie (Aberdeen) wins a free kick in the attacking half. Corner, Aberdeen. Conceded by Blair Spittal. Paul Quinn (Aberdeen) wins a free kick in the defensive half. Goal! Dundee United 0, Aberdeen 1. Kenny McLean (Aberdeen) header from the centre of the box to the top right corner. Assisted by David Goodwillie. Corner, Aberdeen. Conceded by Paul Dixon. Foul by Rodney Sneijder (Dundee United). Substitution, Aberdeen. Ryan Jack replaces Andrew Considine. Attempt missed. Coll Donaldson (Dundee United) header from the centre of the box is just a bit too high. Substitution, Dundee United. Rodney Sneijder replaces John Rankin. Substitution, Aberdeen. David Goodwillie replaces Jonny Hayes. Corner, Dundee United. Conceded by Kenny McLean. Corner, Dundee United. Conceded by Danny Ward. Attempt saved. Mark Durnan (Dundee United) header from the centre of the box is saved in the bottom left corner. Foul by Paul Quinn (Aberdeen). Substitution, Aberdeen. Niall McGinn replaces Cameron Smith. Substitution, Dundee United. Simon Murray replaces Charlie Telfer. Attempt missed. Jonny Hayes (Aberdeen) left footed shot from a difficult angle on the left is close, but misses to the left. Charlie Telfer (Dundee United) wins a free kick in the attacking half. Who will win what in Scottish football? Read more on Scottish football: Who will win what in season 2015-16?